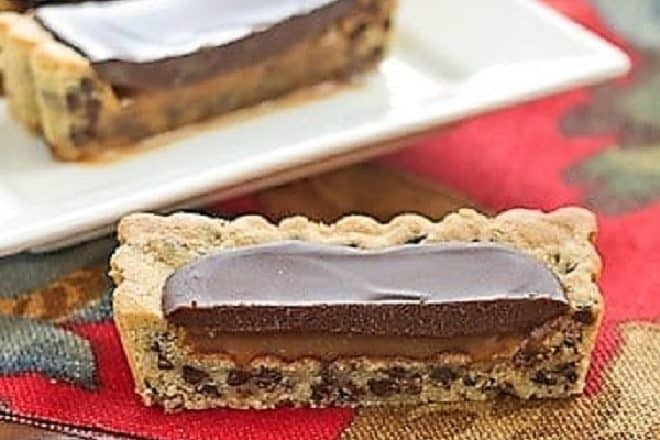 This dreamy Chocolate Chip Cookie Tart with Caramel and Chocolate Glaze hits all my sweet spots: chocolate, caramel and chocolate chip cookies!!! Hooray! 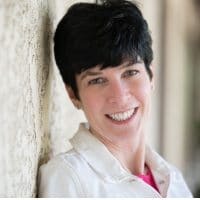 After months and months of waiting, I finally was matched with my dear blogger friend, Danielle, of Hugs & Cookies XOXO, for this month’s Secret Recipe Club. We are both bakers and have been taste testing each other’s recipes for years. She’s a talented cookie decorator plus she definitely surpasses me in having the most decadent desserts on her blog. 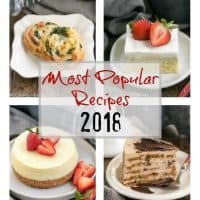 It didn’t take me long to find another marvelous recipe to try. This time up was her tart with chocolate chip cookie dough, caramel and chocolate glaze. Can you see what I meant about Danielle? The name itself is tantalizing! Danielle made salted caramel for her version…but my family is not a fan of salt in their caramels (it takes us a LONG time to accept new food trends!). If you would like to make her recipe, just add 3/8 teaspoons salt to your caramel sauce. My caramel was a little runny…I might decrease the cream the next time; but like Bill commented, they’re gooey BUT good. And Nick, the resident caramel fanatic, was thrilled with these decadent bars. If your caramel is runny, just keep these bars covered and refrigerated. Slice and let warm up a bit before serving. 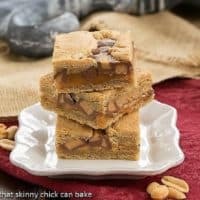 Use a 13 x 4 inch rectangular tart pan to make these bars. A removable bottom is always nice for easy release from the pan. This link is the closest to these dimensions I could find on Amazon. It should work fine. Here’s another from Williams-Sonoma, but it’s pricey! You can tweak these bars by using bittersweet chocolate or even white chocolate for the chips (use a Ghirarelli bar and chop the size of mini chocolate chips) and/or the glaze. 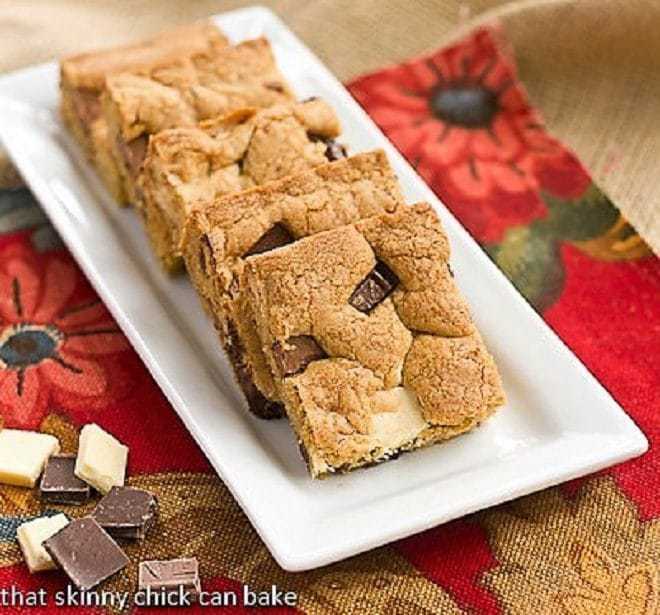 Brown Butter Chocolate Chunk Bars – for chocolate chip cookie lovers! Enhanced by brown butter and 3 kinds of chocolate chunks! 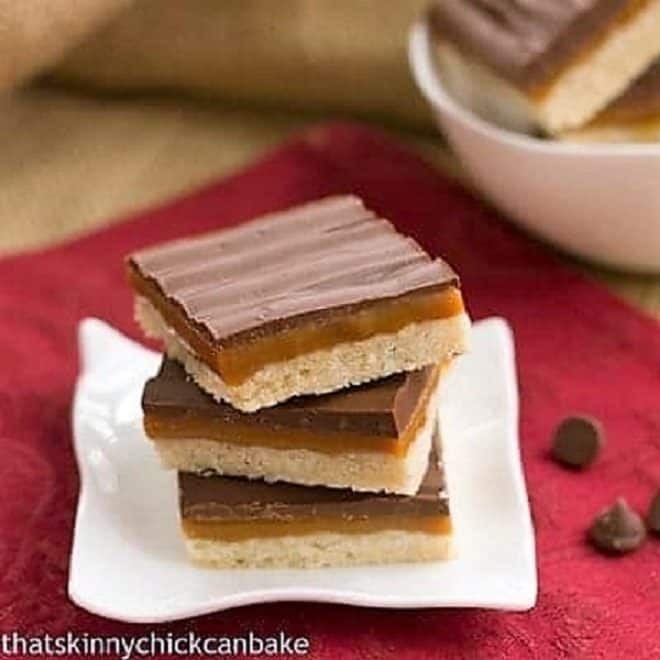 Twix Bars – Layers of shortbread, caramel and chocolate make these Twix bars irresistible! 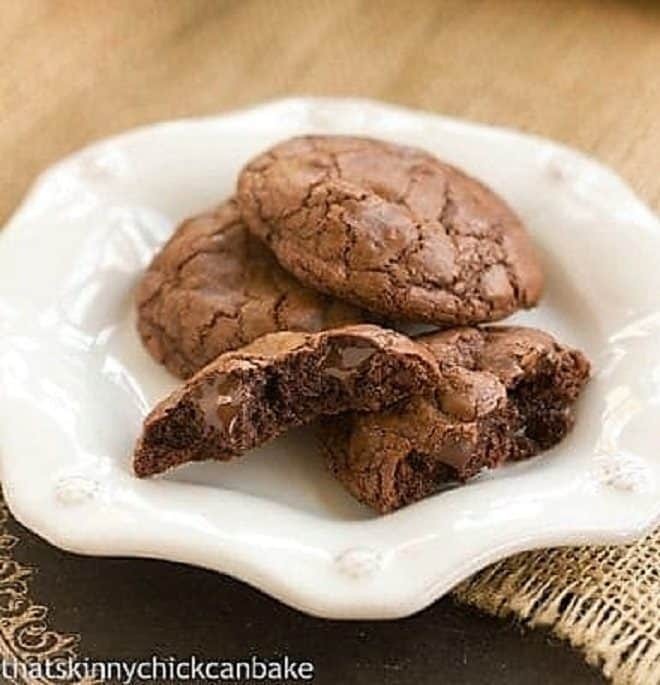 Death by Chocolate Cookies – Chocolate lovers will adore these amazing cookies! A chocolate chip cookie crust topped with caramel and chocolate for a dreamy dessert! Preheat oven to 350º. Cream butter and sugars. Add egg and vanilla and mix till combined. Add dry ingredients and fold in chips. Press cookie dough into a 13 x 4 inch rectangular tart pan lining the bottom and up the sides. Make the bottom slightly thinner than the sides. Bake for about 25 minutes till nicely browned (it will puff up and fill the pan). As soon as you remove it from the oven, press the bottom flat with the back of a spoon to create room for the caramel. Cool completely. Make caramel by spreading the sugar in an even layer in a large pan. Set over a moderate heat and cook without stirring, until the sugar near the edges just start to liquefy. Use a wooden spoon and begin stirring, encouraging the melted sugar around the edges toward the center, carefully stirring up any sugar melting on the bottom, too. The sugar will start to look “pebbly” as it cooks, but keep going until it is melted completely and an amber color. If it starts browning too fast, lower the heat and keep stirring. Be patient…this takes time. Continue to cook until the sugar turns deep brown. Once brown, and remove from heat. Very slowly start adding the cream just a drop at a time, and keep stirring. 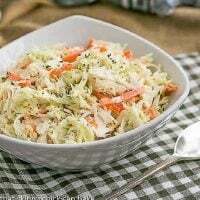 This slow addition of the cream will eliminate seizing. Patiently keep adding a few drops while stirring until all of the cream is mixed in. Once smooth, add butter. Let cool. Pour ½ cup of caramel into middle of tart and chill till firm. Make the glaze by microwaving the butter and chocolate until smooth. Stir in corn syrup. Let sit a few minutes to thicken a bit. Once the caramel is firm and cold you can pour the chocolate glaze over the caramel tart to fill in the empty space. May sprinkle with fleur de sel if desired. I used a non-stick 13 x 4 inch tart pan with a removable bottom similar to this one at Williams-Sonoma. Can´t go wrong with caramel and chocolate ever. Delectable pie Liz! Here we have a similar one, with dulce de leche instead of caramel, and it´s called bonbon pie. It is like eating candy after all! Since just a chocolate chip cookie alone isn’t enough 🙂 I’m dying over this!! This is the ultimate chocolate tart! I love everything about it specially the caramel. Incredible! I can practically taste it through your photos. Absolutely a treat worth indulging for! A super satisfying and delicious meal! aah Lizzy look absolutely amazing! I love too the bars that mad Manuela, look georgeous!!! 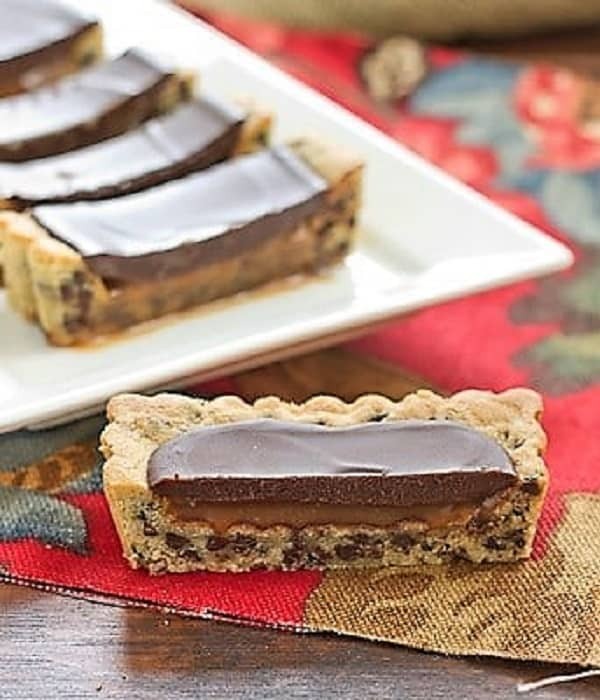 Chocolate and caramel tarts are pretty hard to resist and adding chocolate chip cookie in as the crust? Wow, I want a slice now! This Chocolate Chip Tart with Caramel and Chocolate Glaze looks divine. I think it’ll be the perfect treat to make for any gatherings. So, I can share with others and not eating the whole tart all by myself…and I think I can definitely do that. hahaha…Thanks for sharing. Oh my goodness Liz, this tart looks soo good! It’s like a chocolate chip cookie x 1 million good things – wow. These look amazing Liz and there you go again with your perfect straight cuts! You definitely need to open a little bakery/café! This looks so decadent, Lizzy! You are the queen of beautiful tarts! Caramel is the only super sweet thing I am crazy for and when paired with dark chocolate, it becomes irresistible and addictive. I once made a tart with caramel and covered with chocolate and your beautiful, double-chocolate tart reminds me how good it was. I bet your family loved this one. If you’re going to indulge this is the way to go. Love the pan also!!! Okay, I fell in love just after scrolling to that first picture. These look amazing!! 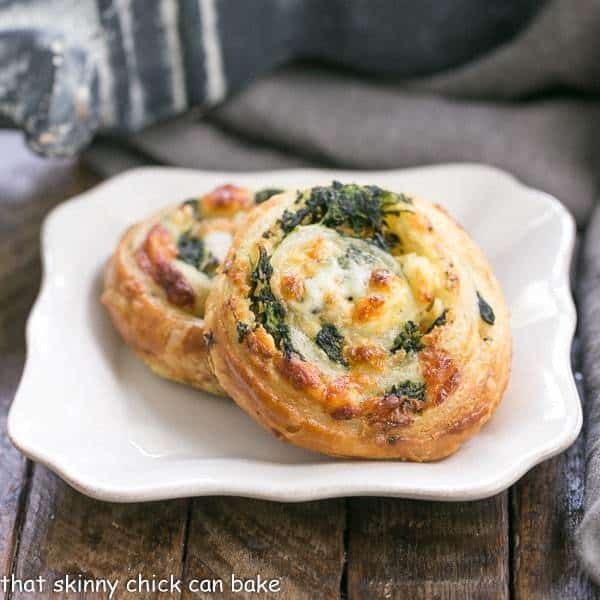 I think I gained a couple pounds just reading this post:@) Love the cute little tart pan you used! I think I gained 10 lbs reading this. Haha – just looked at the post above me! Wow, it would have been great to see this array of desserts at all the buffets we went to in Orlando. It’s hard not to “cheat” on vacation. That cookie tart looks ah-mazing Liz! I’m eyeing your Brown Butter Chocolate Chunk Bars so I’m heading over there next. Great post! Nothing could please me more this morning than to have a piece of this tart with a lovely cup of tea. Beautiful! You had me at Chocolate Chip ..then I read caramel and threw my hands up. Perfection! I love Danielle’s blog and was super excited when we were paired a few months back. 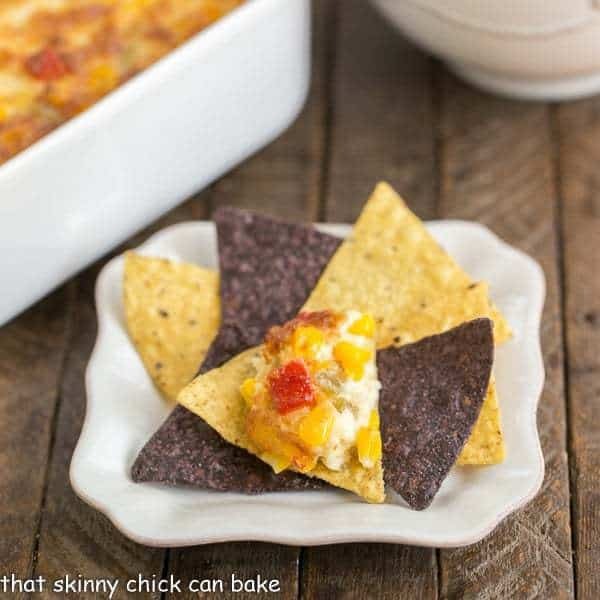 This recipe is yet another one of her amazing treats. Beautiful job! Great pick! This tart looks mouth watering!!! YUM! Beautiful photos too!!! I just bought a tart pan this size — I am dying to make these bars. They look fantastic! You do dazzle dear, Liz. 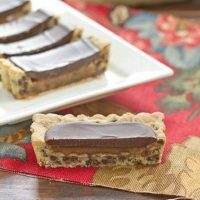 You even elevate the simple chocolate chip cookie bars into a multi-layered tart! One can never go wrong with the combo of chocolate and caramel! The tart looks amazing, Liz. okay, everything I love in one dessert?! wow! what a treat. how fun to be matched up with your friend! I would say neither of you disappointed! My mouth is so watering right now! Beautiful! OMG I woke up and couldn’t get back to sleep so got on my phone and started playing catch-up. Now I’m drooling but won’t go eat anything at 3am. These really look good. Now to go back to sleep and dream about these little treats! This is my kind of recipe as it features all my favorite food groups. I never know where to start with your blog. You have so many great ones to choose from! Just ordered the tart pan, I’m making this as soon as possible, not only sounds delicious, it’s so pretty too!! Thanks, Patti! I’m so glad you ordered the pan! Absolutely gorgeous! (and the bars aren’t too bad either….).. I want this sooooo badly – caramel and chocolate are my two favourite things! Gooey, sticky heaven, Liz. Isn’t it funny how sweet memories can give you that feeling of well-being? Reminds me of my Granny, who used to make chocolate caramel bars. Like you, no salt was in it – just good old plain gungy caramel. Thanks to you and Danielle for such a sweet start to the day here, as the rain comes tumbling down in Paris. Again. You’re sweetie pies, indeed! chocolate chips cookie dough as pasty…caramel…AND chocolate. SOMEBODY PINCH ME! If it were for my vegan heart too I know i’d have died and gone to heaven! 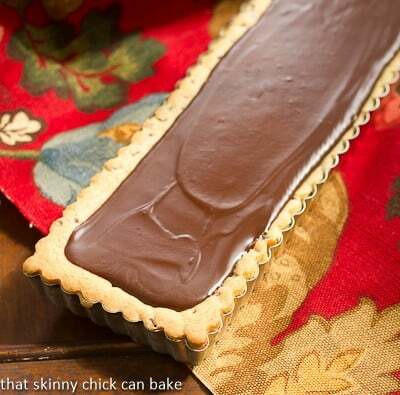 That tart is the Beyonce of the baking kitchen! You mean there’s someone who has even MORE decadent dessert than you?! I’m going to check out Danielle’s blog ASAP! Liz, I love every single thing you make but girl, you hit it out of the park with this one. Chocolate chip cookie as the tart layer?! It’s brilliant (bravo, Danielle). Your tart looks gorgeous and decadent – everything that i could possible want in a dessert is here. I.love.this! I want this! The layers, the flavors, the fact that it’s baked in a tart pan and you dont need to deal with individual cookies. So perfect! Love the density it has. I bet it’s tooth-sinkably fabulous! Can I place an order? Caramel and chocolate – you’re killing me! Girl, I know why you chose this tart! WOWZA! What a combination of beloved flavors…talk about decadent! Oh mY!!!! 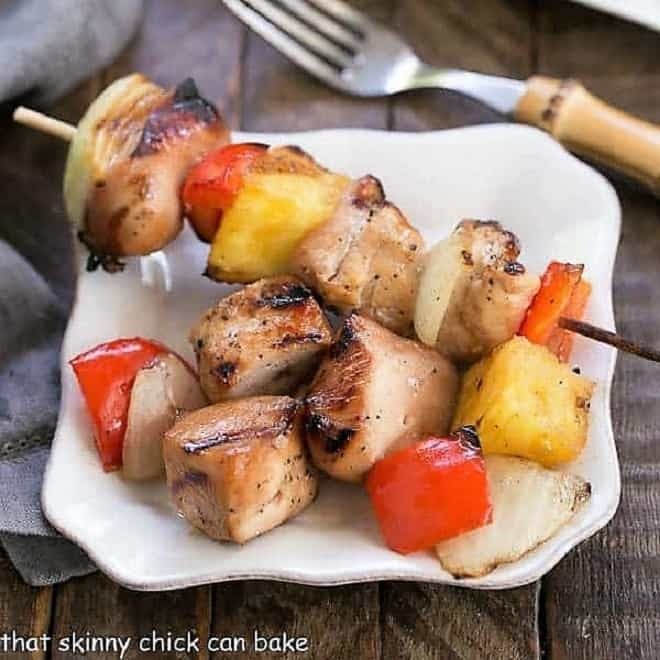 What a fabulous recipe… but one that I could totally see myself devouring all alone… dangerous!! Don’t you love it when you get someone so fun to be your secret??!! Excellent post! This tart is calling my name, Lizzy. I wish I had some right now. I’ll have to make this soon. liz, this sounds wonderful!! can’t believe i missed this in the SRC roundup. yum! Where did you get the pan?! These look amazing! I had to run over here and comment because you made a chocolate chip cookie crust on your tart! And there’s caramel. I’m in heaven. 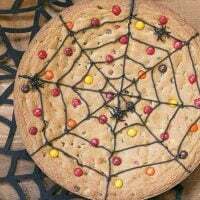 Can I make this using a 9 inch round tart pan with removable bottom? That’s all I have ! You can definitely give it a try. The surface area of my rectangular pan is 52 and a round tart pan is 64. So your crust will be thinner. I’d just bake it for a shorter time. Good luck…fingers crossed it will work for you!